You can export your storyboard project as a PDF file which you can print or share electronically. This is where you can set up your visuals to represent a classic storyboard on paper, or any other format you desire. In the Destination Path field, specify the location and name of the file. In the PDF Export Parameters section, select a layout for the PDF file. We recommend the 3 Panels Horizontal layout. 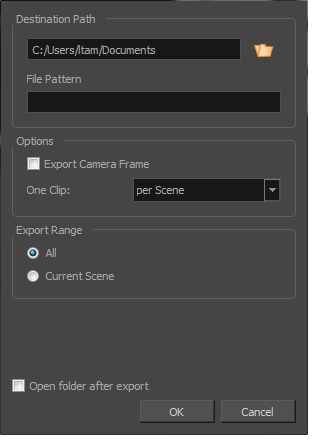 In the Export Range section, select whether to generate a file including the entire storyboard, specific shots, or the currently selected panel(s). We recommend the All option to export the entire storyboard. 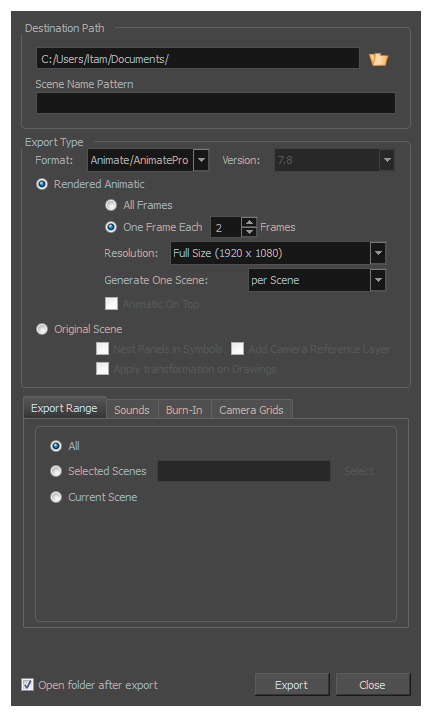 Exporting a storyboard project in FBX format allows you to store any motion data (from element motion or Camera angles/zooms), as well as the 2D and 3D elements in your scene. Once exported to FBX, you can open the storyboard elements in a third-party 3D application and continue to work on them. You would only export these elements to FBX once you are finished with them in Storyboard Pro. Normally, you would not bring these elements back into Storyboard Pro. ‣ Per Sequence: Exports one clip per sequence. This option is available only if your project contains sequences.